I may have waxed rhapsodic about modern architecture in my previous post, but when it comes to modern art, I confess that my aesthetic sense is too grounded in… what do I call it? ah yes. Reality. Maybe the art experts were being ironic; maybe they were being satirical; maybe they were saying that the urinal represented some kind of ultimate banality of art, a deconstruction of what art means, and in so doing became some kind of profound commentary on the nature of art itself. Maybe. I dunno. I don’t get it. 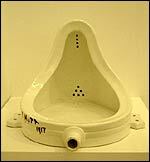 But if a urinal can win the top prize for most influential piece of art in the past century, then I humbly suggest No Knife as honorable mention. I have a suspicion that the key word here is “influential”. Not “good”. Not “inspirational”. Not “extraordinary”. Not “meaningful”. I bet it actually was quite influential. But not any of those other things.